As usual, lately, I'm one day late with this. But I have an excuse, really I do. This is a long armers' busiest season, getting gifts ready for people for Christmas, and that's what I've been spending a lot of my time doing. The rest of the time seems to be spent sitting and either sewing or knitting to get my own Christmas list done. I have some knitting finishes. This little baby boy sweater is finished, except for sewing in the ends. I don't seem to be able to find my large needle that I use for this task, so it will have to wait until I can get out to a store. But since I need to get buttons for this, and also fabric for making pajamas, I can do it all at once. But not today. There is no way I am going near any stores or malls today, it's way too insane out there. Much better to stay at home, get lots done, hopefully, and have a jammies day. The alpaca hat and scarf for Noel is done. I really hope he doesn't turn out allergic to this, since he is allergic to wool. And I have enough of the alpaca yarn to do another hat up, so that is what is currently on the needles. The ribbing section is done, and I'm just starting on the main part of the hat. It's really bulky yarn, so it should finish up in the next day or two. I've used this Dad's Work Hat for the pattern for both hats. The first one knitted up a bit large, so I've cast on less stitches for the second one, and am doing the ribbing as knit one purl one, rather than the knit two purl two as given in the pattern.The scarf was a basic stockinette stitch, with a garter stitch border. Today's task is to start working down my list of things I have to get done in the next couple of weeks, starting with making some pillow cases to go with the Road to Brenham quilt. Binding that quilt is also on that list. And I have to get a start on the colour challenge project for the guild that is due in less than 2 weeks. So, after I link up with Judy's On the Needles, I'm going to start on those pillow cases. The fabric has been washed, but needs to be ironed, and then I'm good to go. However, I'd best get back to work. I'm linking up to Judy's Design Wall Monday. I should mention the pattern source for this quilt. It is from a book by Judy Martin called Patchwork Among Friends. This is the third quilt I've made from this book, and there are several more in it that I'd love to do. 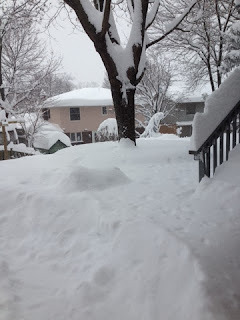 This was the view from our door when we got up this morning. Winter has arrived. We had a guild sew-in day yesterday, and those of us who stayed to the very end had to drive home in this. There was a snow squall warning issued, but those warning so often come to nothing, that we ignored it. Surprise... this one actually had some punch to it. I sure hope everyone made it safely home. It was a very scary drive in mostly white out conditions, and that was in the city. I made a lot of progress on my Thanksgiving Leaves project, a pattern from Judy Martin's book Patchwork Among Friends. Unfortunately, all the fabric for that quilt has already been counted, so my stash report remains unchanged. Only 3 more pieced borders left to go. I have to figure out a new picture taking spot. My old one from the side of the deck has been filled in with snow. Maybe I'll have to talk to Matt and Becca about using their front hall floor. Balance: 44.3 more yards in than out. I have a placemat to make for the colour challenge for the guild that needs to be finished before the next meeting. I might start on that this week, so that will add a little out. But with my focus on finishing quilts, rather than starting any more, I'm not sure whether those numbers are going to change much more before the end of the year. I'm linking up to Judy's Stash Report, and then I think the rest of the day is going to be spent in front of the TV and the sewing machine. Maybe I can get the last of those borders finished. I now have ten leaf blocks done. I put them up on the wall, and added the sashes and cornerstones to get a more complete idea of what it is going to look like. I think I am going to swap out the blue sash and the blue cornerstones for neutral ones. The blues are dragging my eye right to them, and I want to focus to be completely on the leaf squares. I like the little bit if blue that is in the squares, but not any more. I have a lot more of the leaf parts ready to be sewn up, so that is what I will be doing this evening. I've been sewing and quilting like a mad fool for the past couple of weeks. I missed posting a stash report last week, so I'll combine them today. I'd think, for all the sewing I've been doing, I'd have larger numbers to show for it, but all the stuff was cut at the beginning of the quilt, so it's already been counted. I have the borders for Lazy Sunday that I can count, and the fabric for this weeks scrappy browns, and that's pretty much it. I'm linking up to Judy's Stash Report, and then I'm going to do some more work on my Thanksgiving leaves project, and wait for a Skype call with Avery later on this afternoon. He is so cute! Whenever I answer the computer, that sounds rather weird, saying that rather than answer the phone, but anyway, when I answer, the very first thing he says is "Where's Grampy?". Scott and I both talk to him, and it may only be for a very short time, depending on Avery's mood and attention span, but it is always wonderful to see him. Have I said recently - it must have been at least a couple of weeks - I Love technology! Another Saturday, and another week of playing with brown scraps. I'm planning to do eight of these blocks from every posted colour. These three complete my eight blocks, and there's another saturday left yet to the month. I'm actually ahead of the game on this one. There is a sew-in day for the guild next Saturday, from 9am to 9pm, so I wanted to have the day clear for finishing at least one other project, hopefully the Thanksgiving Leaves. I missed posting on the knitting post for yesterday, so I thought I'd do that today, as well. I started this hat yesterday evening. It is a really bulky fiber, 100% alpaca. It is so very soft and cuddly. I'm doing this hat, and a scarf for our son for Christmas. Considering he lives in northern Ontario, and is allergic to wool, these should be perfect. I'm linking up to On the Needles and Scrappy Saturday . I have my next UFO project up on the wall today. It's a pattern called Thanksgiving from a book by Judy Martin called Patchwork Among Friends. I have 8 blocks done, and 8 more to do. Then there are the border units. It actually goes rather quickly, once I set my mind to it, and work at it steadily. I'm not going to set myself a time limit on this, but at the same time, it would be nice to have this one done by the end of the year. And now, I'm, looking for some opinions. I've had my Grandmother's Diamond Ring down off the racks where my quilt tops are stored, and I'm trying to come up with a design for the quilting. I've got something laid on top of the quilt in this picture to the left. What do you think... is it too much for this quilt? Do you like it or do you have any other ideas? There would be continuous curves in the piecing. I'm not sure about the borders, yet. I managed to get 2 more brown scrappy triple four patches made last night. I've been using my recliner chair as the setting for most of my pictures that only need a small area. It has the Ott light behind it, so I get the most accurate colour representation there. But that's why there has been that burgundy fabric in the background of some of my pictures lately. I have a portable one that I should dig up, and then I wouldn't have to use the chair, I could spread out on the floor, or something. But anyway, this works, for now. With the shorter days, daylight pictures are harder to come by. I'm hoping to go over to Gail's for a couple of hours sewing this afternoon. I now have Lazy Sunday completely finished, although no picture yet, I'm waiting for the wind to die down so I can get one outside. If not, I'll take it and pin it up on my design wall later this morning. But, with that one done, I am now moving on to Thanksgiving Leaves. I pulled it out of it's box last night, and found that I have 6 blocks done, and a seventh started. I need either 12 or 16, depending on the size I decide to go with. So, that is next in my line up of attempts to finish without starting anything new. This scrappy challenge is a new start, but it barely counts because it's such small amounts each week. At least that's my story, and I'm sticking to it. I'm linking up with Soscrappy. There are more fun brown scrappy things to see there. Wow, two posts in one day! I'm just a writing machine today, on top of being a finishing machine. LOL! I had hopes of showing a new knitting project today that I had started yesterday. However, the tension was all wrong, so I ended up ripping it all out, and ordering the appropriate sized needles. I got a bit confused, since the pattern specified one size needles to get the right size, and the yarn specified another. I made the mistake of going with the pattern recommendation, and ended up with the stitches being way too small. Note to self, when using very expensive alpaca yarn, do a gauge swatch first. However, all this means that I will be finishing Avery's truck sweater instead of starting something new. I have another finish! I'm turning into a lean, mean finishing machine, well, maybe not lean, and certainly not mean. The binding went onto Orca Bay yesterday. It was pouring down rain yesterday, though, so I couldn't get any pictures until this afternoon. I wanted this quilt to be a bit bigger than the original instructions, so I added a couple more borders to it. decided to use a very basic design for the quilting. I've been using this one more often lately, Square Spiral by Keryn Emmersen. I like the way it follows the strong diagonal lines in the piecing. I used one of the diagonal stripe fabric I keep in my stash for doing bindings, and again used a faux piping technique to sew the binding on completely by machine. For some people, doing the final part of stitching the binding by hand is one of their favourite parts of doing the quilt. I'm not of that mind. By the time I get to putting the binding on a quilt, I am usually more than ready to have it done, and don't want to take the additional time to hand stitch it down. There's a short tutorial on how to do this kind of binding here. Unless I have an irregular edge on a quilt, or piecing where the points would end up cut off, this is my go to binding . I'm linking up to Finish it up Friday and Can I Get a Whoop Whoop in order to celebrate this finish. I've had three customer quilts go home this past week. Two for Charlene and one for Amalia. This first one here is Charlene's. It's a pattern by Edyta Sitar, and is done completely with 1 1/2 inch strip scraps. Charlene never lets anything get away from her. I used a very simple Square Spiral pattern by Keryn Emmersen for this quilt. The diagonal lines complement all the horizontal and vertical lines in the piecing, with some gradual curves as well. I love the texture the quilting adds to all the fun fabrics in this piece. And, as I said I would try to do more often, here's a glimpse of the back. This quilt is Charlene's as well. It's a complete departure from the scrappy one above. This one is calm and toned down, and reminds me of a good cup of coffee. I found a really fun new pattern on the Digitech Designs website called Modern Bricks by Krista Withers. I think it fits the modern design of this quilt perfectly. Here's a close up of the front. And the back. I off set the pattern by one quarter for each row. I love all the movement in this design. This quilt is Amalia's, a string pieced Lemoyne Star. 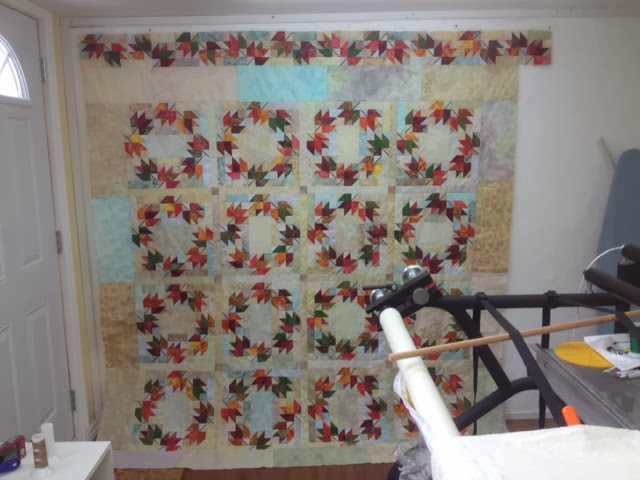 A couple of weeks ago I was reading Vicki's blog post here, and she was talking about doing a quilting design where she could do the border at the same time as the rest of the quilt. A bell went off in my head, and I thought, I have got to try this. And when Amalia's quilt came up, it was a perfect opportunity to try this technique. I did continuous curves in the star points and the background squares. While browsing through one of Darlene Epp's resource books, I came across a design she called iron fence. When I saw that one, it was a perfect choice to adapt for this technique, since the point of the border design meets up with the pint of the piecing. My original plan for the quilting did not include the swirl in the background squares, but when I saw the swirl in the border design, it was a natural progression to put one in the background squares. This one was a lot of fun to do, and I learned something new in the process. Have I mentioned lately, that I love what I do? Thanks ladies. Great Granny is finally finished and off the wall. All her borders are on, and, after I took this picture of her draped over the long arm machine, she went to hang up with the rest of my quilts waiting their turn on the machine. So, now I have the Bonnie Hunter mystery that ran in Quiltmaker magazine last summer called Lazy Sunday, up on the wall. But It's only there briefly. I'm going to be working on this as a get it finished project, in my quest to, if not cure my startitis, at least cut down on it a bit. I'm currently working on getting the last 2 of the green triangle borders put together, so they can go on. I really like the yellow border in this. It makes it happy and sunny, just like what a lazy summer Sunday should be. I've been watching the posts at So Scrappy for a long time. She chooses a colour of the month to concentrate on for using up scraps. I've been wanting to participate for a long time, so I've decided to jump in. There's also been a quilt that I've been wanting to make for a long time, a triple four patch. So, I've decided to combine the 2. I've been doing really well with finishing things lately, and since this will be long term project, it won't take that much time from finishing other things. So, I'll use these blocks above as the body of the quilt, eight of each month's colour. And then since I'll have little four patch units left over, I'll use these as the border. I played around in EQ7 for a while to get the sizes and the numbers of blocks that I'll need. I have 5 more browns picked out, so I can work on them off and on through the month. And every little bit helps to increase the stash used numbers. I finally managed to get the Great Granny finished, so there was border fabric cut and used for her, and I worked on Lazy Sunday, but that fabric was already counted, so there wasn't much fabric out this week. Balance: 45.3 more yards in than out. I'm working away at the Truck Sweater for Avery for Christmas. The back is finished and blocked. One of the sleeves is finished and blocked. And the second sleeve will be done by the end of the evening, and then I can cast on and start working on the front. I left the fun part til last. I've been rummaging around in all my drawers of yarn, and have found some that I think will work for the truck. Some of them are a bit of a smaller gauge, so I hope it doesn't cause a problem, but I won't know for sure until I get there. I went looking for other yarns of the same gauge as this yarn, but there weren't any small enough balls in the store, and I really didn't want to be buying a large ball, just to do the colours in the truck, so I'll make do with what I have. I'll know more by this time tomorrow. I'm linking up with Judy's On the Needles.